I hosted Mack to a decadent breakfast-for-dinner on Friday night, before we danced all of it off over vodkas and the gorgeous Swedish pop of Robyn. The menu included: eggs benedict with uncured turkey bacon, homemade lemon hollandaise drizzled about everything, roasted asparagus, and fresh cut southern style hash browns. Of course, someone told me that bottle of champagne I’ve been holding onto for an exciting life moment was holding me back and giving me bad luck, so we decided Friday night was the perfect opportunity to get this champagne elephant out of my kitchen. 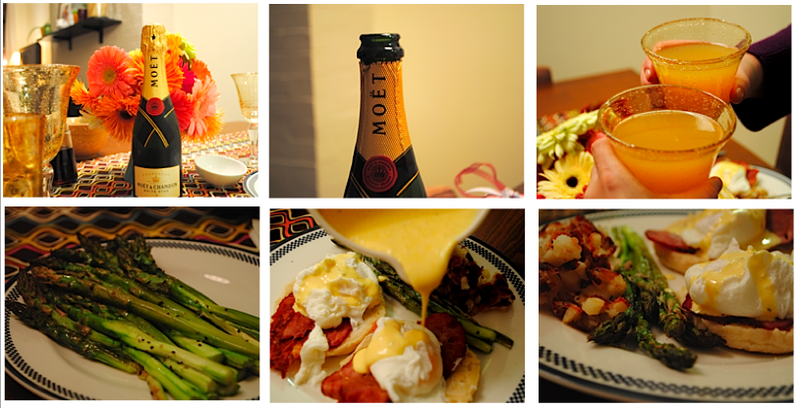 Popped, bellinis indulged in, as all 27 year old women having breakfast-for-dinner parties should. And I might feel more free now that I know its been guzzled for good measure. In the venerable words of Robyn, Mack and I certainly are now dancing on our own. Cork it. so glad you drank that champagne! so much more space now. so true! great advice! i already feel better. i think?